Taking advantage of its beautiful waterfront views, this coastal home features numerous windows and three porches. Clapboard siding, metal roofs and an elevated pier foundation grace the exterior for a traditional beach house appearance. An open floor plan distinguishes the first floor, where the great room boasts a ventless fireplace and flanking built-ins. The kitchen is spacious yet efficient, with a helpful pantry. Upstairs, a sitting room with access to a third story loft provides privacy for the master suite and a secondary bedroom. 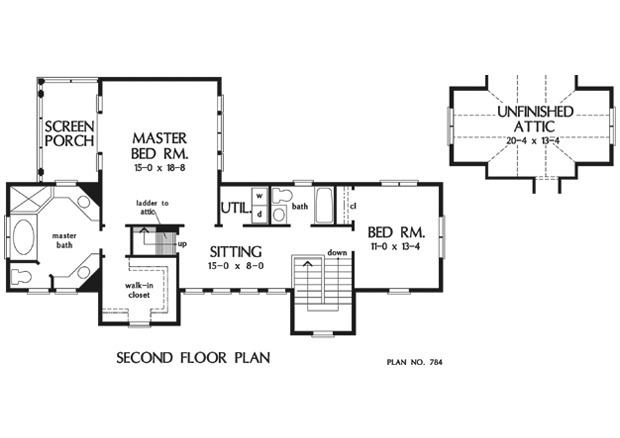 The master suite enjoys a luxurious bath, generous walk-in closet, a wall of windows, and a private screened porch. 2nd Floor: 1019 Sq. Ft.
1st Floor: 1065 Sq. Ft.
Other Storage: 296 Sq. 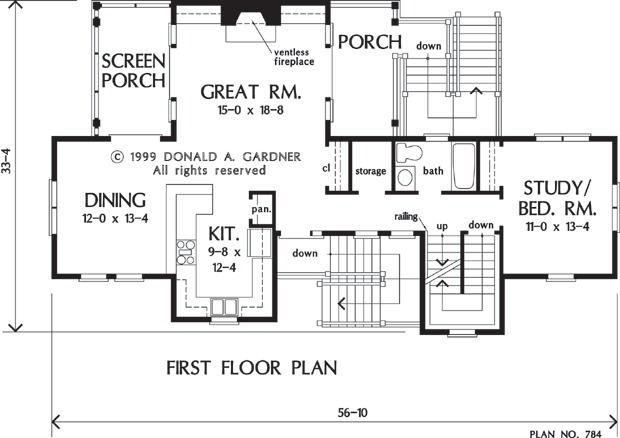 Ft.
House Dimensions: 56' 10" x 33' 7"
Great Room: 15' 0" x 18' 8"
Master Bedroom: 15' 0" x 18' 8"
Porch - Front : 5' 4" x 4' 4" x 0' 0"
Porch - Rear : 7' 0" x 13' 8" x 0' 0"
Porch - Screen : 7' 4" x 13' 0" x 0' 0"
Storage (Other) : 4' 0" x 5' 0" x 9' 0"
Other : 15' 0" x 8' 0" x 8' 0"
Other #2 : 7' 4" x 13' 0" x 0' 0"
Other #3 (Vaulted): 20' 4" x 13' 4" x 7' 5"
Master Bedroom : 15' 0" x 18' 8" x 8' 0"
Great Room : 15' 0" x 18' 8" x 9' 0"
Kitchen : 9' 8" x 12' 4" x 9' 0"
Utility Room : 6' 4" x 5' 0" x 8' 0"